Protect yourself and your family with our proprietary Rev It Up™ immune system booster!. This fragrant blend of pure essential oils provides a strong defense against viral infections while rebuilding weakened immunity. Don’t face cold and flu season without it! You know your children (or grandchildren) are walking petri dishes, bringing home every virus or cold that makes its way around the school. Inshanti’s Rev It Up!™ delivers a daily dose of powerful essential oils to protect your immune system from the onslaught. Safe to use regularly, it’s especially essential if you have a compromised immune system or are traveling. You’ll gain the benefits of the immune-boosting, circulatory-stimulating, and detoxifying properties of this powerful fighter. 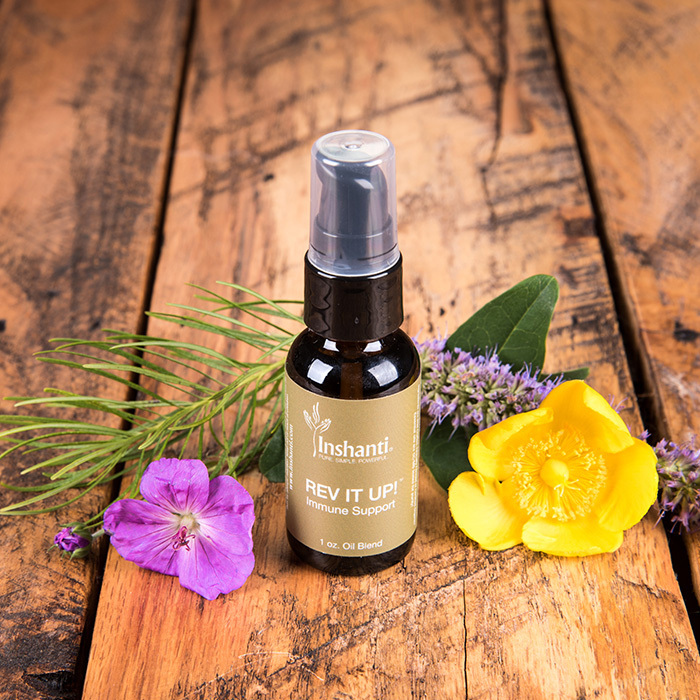 Accelerate your immune system by applying essential oil blends like Inshanti’s Rev It Up™! to the bottoms of your feet, underarms, under the chin, and chest area before going to work, school and travel. Use as often as needed. Support your respiratory system with this special variety of rosemary. Rosemary 1,8 cineole (pronounce “sin-ee-ole”) is one of our three rosemary oils and has antimicrobial properties that make it valued for fighting inflammation and dealing with viruses. Inhale the robust aroma of ravintsara to allow its antiviral and decongesting power to handle sinus problems, the flu, and bronchial congestion. This oil is also effective for shingles and herpes zoster. Break up stubborn mucus caused by colds and chronic sinus problems with Inshanti’s unique essential oil powerhouse—Viral D nasal oil. With a simple swab around your nostrils, you’ll put the punch of our best-selling illness fighter to work for you. Purify your home and your mental state with this uncommon oil from Madagascar. Saro essential oil has strong antiviral, antibacterial, and antifungal properties shown in studies to target bacterial and viral infections. Its beautiful fragrance will energize you, enabling you to overcome any lethargy. 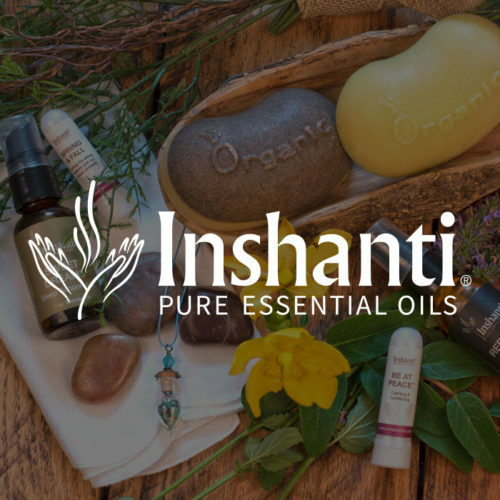 Stimulate your life and your circulation with Inshanti’s certified organic rosemary camphor essential oil. This rosemary variety is grown at higher elevations, which produces more camphor, an aroma you’ll recognize because of its prevalence in products to relieve muscle aches and sports injuries. Our oil allows you to go right to the source! Bring focus to your life with spike lavender essential oil. The oil has strong anti-inflammatory and analgesic properties that work to reduce headache, muscle, and joint pain, making it a great fit for blends targeting inflammation. Cleanse your mouth with Inshanti’s bacteria-killing Immuno Mouthwash Oil. As it fights bad breath, it works to heal inflamed gums and ulcers. The refreshing oil stimulates your immune system; use it as an anti-infectious gargle when you start to feel sick. Protect your family from infections with this unique blend of four thyme oils crafted to create a powerful antibacterial germ fighter. Benchmark thyme is gentle on the skin so you can safely use it on your children. Pamper your hair and skin with this special variety of rosemary. Rosemary verbenone is the gentlest of our three rosemary essential oils and its chemical composition makes it a great choice for helping your body look and feel its best. It can also provide support for your liver and enhance mental clarity.